Here are a few of the questions that are often asked about the Ouidah Homeless Children's Project. Is this a fair price for this property? I wish I could say Yes, but because it's in a small African town where they do not have the same tools and processes for real estate sales, I just cannot tell if the price is fair. My hope, is to travel there with the money and do some research on the ground. Then if the price is too high, I will be in a position to negotiate a better price and use the money saved to buy things like toilets and beds and more. Martine says the price is fair and she owns and lives in the property next door, but I would hope to have more data points than that. What is APEF and why should they own the property? APEF is a registered NGO in Benin and has been helping women and children in villages since 2001. I went on a couple village visits personally and it is quite inspiring. APEF has a 6-member board of directors (Martine is the President) and the organization will own the new property. The project will be visited regularly by the Salesian Sisters (an international organization with offices and schools in Benin) who will report back to me to assure the project continues to operate as intended. What if something goes wrong and the project ends? This is an issue that has concerned me from the start. However, I think there is no other answer than APEF will sell or control the facility and be subject to the rules governing an NGO in Benin. Martine has been selflessly taking care of these kids for 5 years so I think she is a person who will do the right thing in that situation. Martine da Souza is the founder and head of APEF, registered local NGO that helps women and children in the villages by teaching them how to avoid child trafficking and HIV, and to know their legal rights in domestic issues. She has also been a licensed guide for almost two decades and speaks five languages. 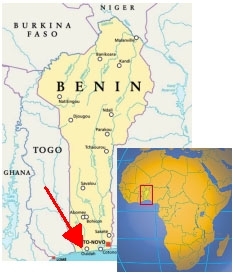 She has translated for many dignitaries in Benin, the U.S., and other countries. She comes from a prominent Ouidah family but has made it on her own. I spent every day in Nov 2013 with Martine and she was honest, knowledgeable, and a pleasure to be around. I trust her completely or I would not be heading this project. How many children can this project serve? Martine would like to serve as many children as possible. She is currently serving 8 boys but other homeless children have asked her for help. With 4 large bedrooms, 24 is probably the maximum. She will start 12-16 and see how that goes. Having too many children in the facility is an invitation to problems and demands more supervision. Martine, her mother, her children, and a local schoolmaster have been supervising the children. Mostly, it's Martine who supervises the kids, and her mother does most of the cooking. So far, cooking, eating, showers, washing clothes, and lessons have taken place at Martine's house, next door to the new property. That will shift to the new property if we can purchase it. With more children and a more complete facility, more supervision will be added. The property is about 1740 sq ft with a huge fenced and gated yard. It's on a safe, middle class street. The yard will make a fantastic garden. The 4 bedrooms are large and will each have 2-3 bunk beds. There are 2 bathrooms, each with a toilet, sink, and shower. The kitchen and living room are large and open to each other. We'll get 4-5 tables and 20 chairs for eating and hanging out. The kitchen needs to be outfitted. Gas and water need to be hooked up too. Later, the option to add second level will be considered. (The house was prepped for future second level during construction.) Martine and I have detailed architectural drawings for the structure and property. The property is owned by a Frenchman living in Paris who has never occupied the property since purchasing it in 2007. I met the children in Nov 2013 and they are a delight. They are very considerate and cooperative. It's hard to believe they all lived on the street. They started school this year for the first time. Antoine, the headmaster of a school about 30 minutes away, has been tutoring them for a few years (along with Martine). In their first year, they are at the top of their classes. There is too much to say about these children for this small document. What happens to my donation if donations fall short of the goal? If we don't raise enough money to buy the property, the donations will be deposited in Martine's NGO account to be used exclusively for school expenses, food, clothing, medical, and other essentials for the kids. Or possibly, another property or housing opportunity will be found. She is very frugal and resourceful and will use the money wisely. If the kids have to vacate the house, I predict Martine will find some place nearby for the kids to sleep (probably outdoors but better than the alleys) and she will continue to supervise them and take care of their daily needs for as long as she is able. I will also monitor things from afar and interact with the board of directors of her NGO. For daily updates and a lot more, please "like" our Facebook page and share it with your friends. For more detailed information on the project, read our FAQ. You can make a donation to the "Ouidah Homless Children Project " via the internet. Click here.